Flavours I Luv: Rasgulla And Rasmalai Recipe For 1st Blog Anniversary! Rasgulla And Rasmalai Recipe For 1st Blog Anniversary! My blog's first anniversary! I can't just believe that I have been scribbling in here for 1 year!! Lots of experiments, trying out new ingredients that comes in every day cooking, discovering new taste, learning new cuisine and trying to perfect each and every dish has all become part of a blogging routine. I've come up a long way. It wouldn't be possible without you readers who leave wonderful comments which keeps me going. Thanks a lot for that!!! I decided to make Rasmalai, traditional Indian sweet to this special occassion. Rasgulla and Rasmalai are prepared with freshly prepared chenna (cottage cheese). 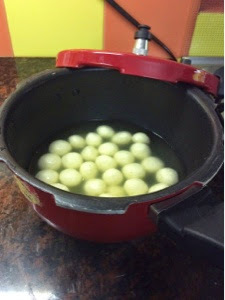 For Rasgulla, the chenna balls are cooked in sugar syrup till they double in size. For Rasmalai, chenna balls that have been cooked in sugar syrup and further immersed in sweetened thick milk to cook till soft. You can make Rasmalai by using instant readymade Rasgullas also. Heat the milk, when it start to boil, simmer the flame, add the lemon juice. At first do not stir, after sometime stir only one or two times. Heat until the whey water clearly separates. Put off the flame. Add the ice cubes and mix well. Adding ice cubes prevents the chenna (Paneer) to become hard and helps for soft texture. Take a strainer, lined with a cheese cloth/muslin cloth. Pour the curdled milk into it. Pour water into it to remove the lemon smell and sourness. Then squeeze the excess water gently and hang it for sometime. Take out the paneer in a bowl and knead gently to make it a soft and smooth dough. Make smooth equal sized small balls. Take sugar and water in a pressure cooker and add cardamom (Elaichi powder). Boil it till sugar dissolve. After the sugar get dissolved completely and the syrup boils, add the balls made carefully one by one. 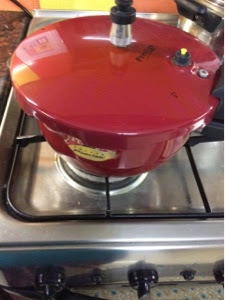 Cover the pressure cooker and cook it till you get one whistle in medium flame. After a whistle, simmer more and keep for another 5 minutes. Put the off the flame and let the pressure release by itself. Open the lid, by now it would have doubled in size. Remove onto a serving dish, allow to cool. Refrigerate and serve chilled along with sugar syrup or proceed to prepare Rasmalai. For making rasmalai, take an heavy bottomed/non-stick vessel, boil milk until the volume reduces to half. Add sugar and milkmaid and let the sugar dissolve, then add cardamom powder, pista and badam. Squeeze the sugar syrup from the rasgullas gently and add it to the milk. Simmer for sometime. Off the flame, after it cools down, refrigerate and serve cold. Happy blog anniversary dear.. Yeah time is moving on.. thanks for sharing Such a yum yum rus gullas n ras malai ma favorite ..
Congrats, for completing one year of blogging and wishing you many more years of successful blogging. yummy Rasmalai, they have turned out so well, nicely presented. Wow...... perfect rasmalai! Looks really inviting!